"As for me, I'm perfectly happy, firstly because I'm Caresco's masterpiece, and secondly because, no longer possessing many of my organs-no legs, no left arm, no right kidney, no stomach, no cecum, no colon, no inferior part of the liver, no right lung, no maxilla and no reproductive organs-I've greatly diminished the chances of physical suffering and the mental disappointments inevitably attached to their functioning or their desires." "Would it not have been more complete, in that case, to suppress your existence totally?" said Choumaque. "When the Superman wishes to take me!" affirmed the half-man, with pious respect. "To what marvelous being do I have the honor of speaking? Will you tell me your name?" the professor asked. He was surprised to hear the reply, delivered with equal politeness: "I have no name, Monsieur. That too has been removed." 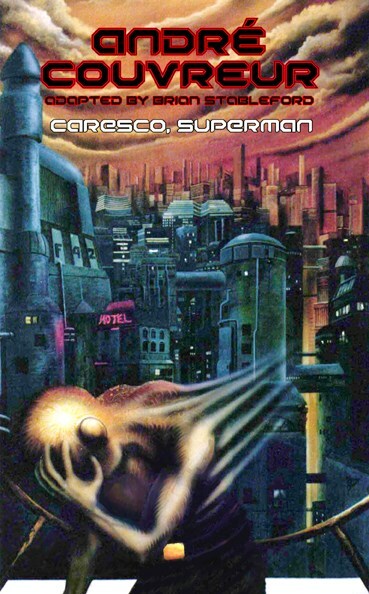 After the events of The Necessary Evil, Dr. Caresco returns in Caresco, Superman (1904), in which the brilliant but mad scientist rules the body-shaped island of Eucrasia whose inhabitants have been transformed -- "improved" -- by a variety of advanced surgical techniques. The natives are addicted to sensual pleasures, subservient to the will of Caresco, whom they call the "Superman", for fear that he will castrate them--or worse. André Couvreur (1865-1944) was a medical doctor who penned several medical treatises, and was also the author of eight romans scientifiques dealing with "medical concepts" featuring the mad scientists Doctor Caresco, then Professor Tornada. These are collected in a series of five volumes, translated and annotated by Brian Stableford, presenting for the first time the ground-breaking works of this pioneer of French science fiction. "Couvreur's works are unusually exotic, and unparalleled in the history of imaginative fiction." Brian Stableford.